Someone posted this pic on Facebook with the following note:Went to the Orange Bowl last night and saw several of these clueless people running around. I went to FSU, and back then, no one did this. On the front page of this morning's the Sun Sentinel newspaper, is this picture. The girl in front of me told me she bought a headdress online because she, "wanted to get on TV." He's going for a pure stereotype: All Indians look the same, and all look like a Plains chief. He doesn't know or doesn't care that a Plains chief has literally nothing to do with a Florida-based tribe a couple thousand miles away. This is a fine example of how mascots promote false and stereotypical perceptions of Indians. No one's correcting fans like this one; no one's telling them they're wrong. Just the opposite, in fact. Allowing behavior like this, and showcasing it in a newspaper, makes it seem acceptable. The message is that this is what Indians are like. 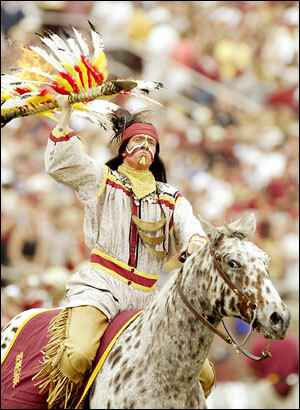 For more on the subject, see Seminole Homecoming Queen in a Headdress and Chief Osceola Is "Respectful"?